Its the first in a series. 3Q GDP: Is the Recovery Recovering? 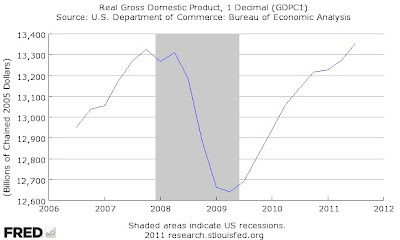 The BEA's advance estimate of real GDP growth for the third quarter was 2.5% (annual rate). 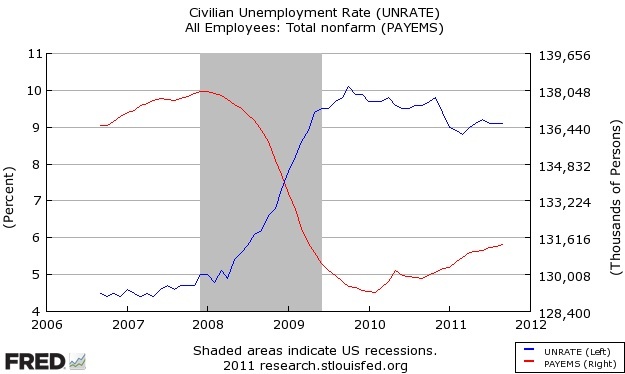 That's in the same ballpark as the long-run trend rate of growth - i.e., its a pretty normal growth rate, consistent with maintaining a stable unemployment rate as the labor force and productivity rise over time, but not fast enough to dig the economy out of the hole (14 million unemployed) that its in. 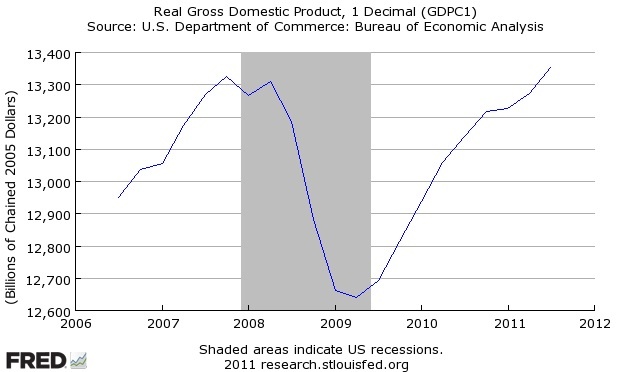 It is, however, a significant improvement over the first two quarters of 2011, which saw growth rates of 0.4% and 1.3%. Also, this puts real GDP back above its pre-recession (4Q 2007) peak; a milestone we previously thought had been attained at the end of 2010 until the estimates were revised downwards last summer. More reaction: The Economist's "Free Exchange" blog, NYT's Catherine Rampell, Calculated Risk, James Hamilton, Mark Thoma, RTE's round up of Wall Street "economists." The Structure of Macroeconomic Revolutions? Macroeconomics sometimes appears to be a somewhat confusing swirl of models and "schools of thought." This can be a somewhat off-putting feature to students (though for some of us it is also part of what makes macroeconomics more interesting than microeconomics). When I introduce it to my students, I make a nod to Thomas Kuhn's "Structure of Scientific Revolutions" framework, which provides a way of putting some structure on the development of macroeconomics that is more sophisticated than framing it as a series of "debates" between "sides" (i.e., "classical" vs. "Keynesian", "saltwater" vs. "freshwater", etc.). My view, with both all due respect and all due derision, is that the Robert Lucas types are like the early Copernicans here. There’s something admirable in their insistence that it ought to all work out to an easily modeled system grounded in compelling theoretically considerations. The New Keynesian model is a mess, like late-Ptolemaic astronomy, thrown together to account for observed reality. But you don’t fly to a moon with an elegant model that delivers mistaken predictions about where the moon’s going to be. And what we actually need is a Kepler to give us an elegant model that actually predicts the phenomena, and then a Newton who can explain what that model means. Hmmm... I'm more inclined to place the users of old Keynesian models, including the IS-LM-based macroeconometric models used by policymakers, in the "late-Ptolemaic" role, but, in any case, the Kuhninan approach helps explain why I simultaneously agree with Brad DeLong, Paul Krugman and Greg Mankiw that the IS-LM model remains a very useful tool, while being a little more optimistic than Krugman about the state of macroeconomics. Also, I'm not sure that Lucas and others (including new Nobel laureate Tom Sargent) who have pushed macroeconomics towards "structural" or "micro-founded" models are leading us to an "easily modeled system." What counts for "elegance" in modern macro is consistency between the macroeconomic model and micro-economically optimal behavior on the part of consumers and firms (I suppose the obvious retort to that is to invoke Emerson: "A foolish consistency is the hobgoblin of little minds"). The euro was designed to be the Roach Motel of currencies. Once you enter, you can never leave. There is no provision for departure. Hmm... Norris' column might be a good reading for Econ 270, but will Greece still be in the euro by spring semester?? Norris is referencing this vintage TV ad. The BLS reported today that employers added 103,000 people to their payrolls in September, of which 45,000 were workers returning from the Verizon strike. That's not a great number - due to natural growth in the labor force and productivity improvements, the economy needs to add roughly 130,000 jobs per month just to keep the unemployment rate from rising. But in light of fears that the economy could be sliding into recession due to the hits on confidence from the debt ceiling fiasco and Europe's woes, a continuation of the pattern of sluggish employment growth may be somewhat of a relief. Also, July employment growth was revised up from 85,000 to 127,000 and August was revised from 0 to 57,000. The numbers from the household survey (which has a smaller sample, so is considered less reliable) were more encouraging. The unemployment rate held steady at 9.1%. The number of people employed rose by 398,000, but the reason that didn't bring the unemployment rate down is that the labor force grew by 423,000 and the labor force participation rate ticked up to from 64.0% to 64.2%. 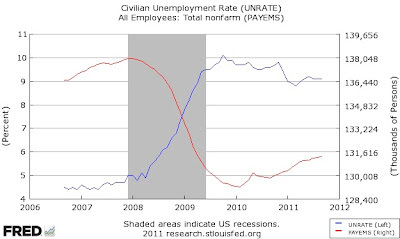 The unemployment rate is measured as a percentage of the labor force, and to be counted as in the labor force, someone must report that they are working or looking for work, so this is a sign that people are re-entering the labor force, which may mean that they are more encouraged about prospects of finding a job. Overall, the economy remains in a deep hole, with nearly 14 million people unemployed, 6.2 million of whom have been out of work for 27 weeks or longer. Government continues to be a drag on employment (i.e., the exact opposite of what it should be doing); government payrolls fell by 34,000 in September. The BLS noted that local government employment has fallen by 535,000 since September 2008 (more on this from Floyd Norris). On a non-seasonally adjusted basis, the unemployment rate fell to 8.8% in September and payroll employment rose by 519,000. That is, September is a month that normally sees an improvement in the employment picture, which is removed by the seasonal adjustment factor. More reaction: Calculated Risk, Mark Thoma, RTE's round up of Wall St. "economists". SCHUMPETER thought of Keynes as his natural rival for the title of “greatest economist.” They were born in the same year, 1883. Keynes probably did not believe that he had a natural rival.